A couple of interesting glass negatives from a batch of 27 found in a shed in Devon by Tony Rowe (UK). Dating the car could help date negatives. -- Started an interesting search determining mistakes and confusion in web data. 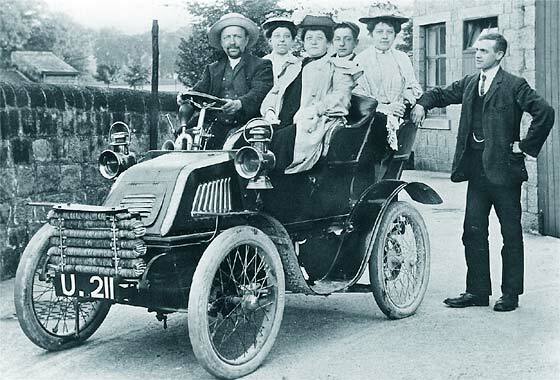 This is a cca 1902 Rochet Vis-a-Vis, with a 4.5hp De Dion engine, made in Lyon by Rochet Freres et Cie, and sold in UK by British & Foreign Motor Car Co, Liverpool. No connection with Rochet Schneider, Lyon or Ste Rochet, Paris. Interesting reversible front seat. Puzzling photo received from Robin Longbottom (UK) sent on behalf Tony Ingham. It shows the Widdop family and on board a vehicle in the village of Sutton in Craven, North Yorkshire. -- Very unusual curling louvers ruled out many makes. Fortunately our John Warburton felt the foreign look suggested a Charette but later 1902'3 International Armstrong Tonneau matched identically. Imported car built in France. External radiator matrix was common, but later add-on on to this car. Photo received from Ian Elliot (Eire) who owns Corravahan House in Drung, an Irish Historic House open to the public. 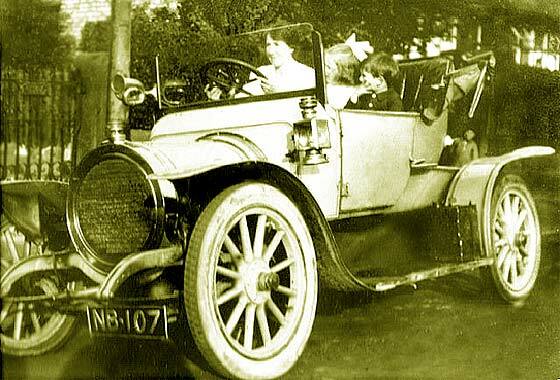 The photo is dated 1904 but he cannot quite find a match for this car. 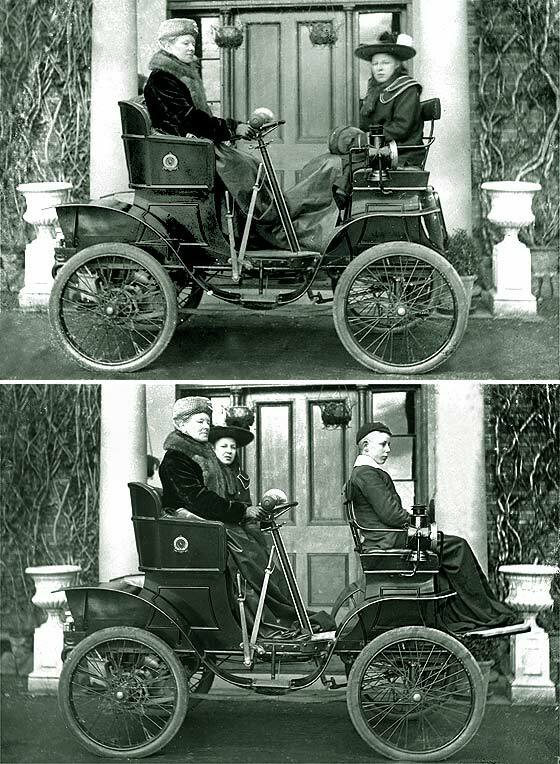 Could it be a 1903/4 Panhard et Levassor? Can we make an exact identification as it might help identify the occupants.-- Sorry, not a P&L, but it is French, from Alsace. This is a cca 1903 De Dietrich 24HP Rear Entrance Tonneau built in Luneville, based on Turcat Mery of Marseilles, made on Panhard lines. Another photo received from our regular contributor Joao Ferreira (Portugal). This is the first bus operating in Funchal on the island of Madeira. It has the registration "4-M". A Brasier?-- Almost, actually a Richard-Brasier and quite early one. Georges Richard started in 1897, made Vivinus under licence, and was joined by Henri Brasier, ex Mors, in 1902. Brasier designed some big cars and went Gordon Bennett racing. Won '04 - '05. 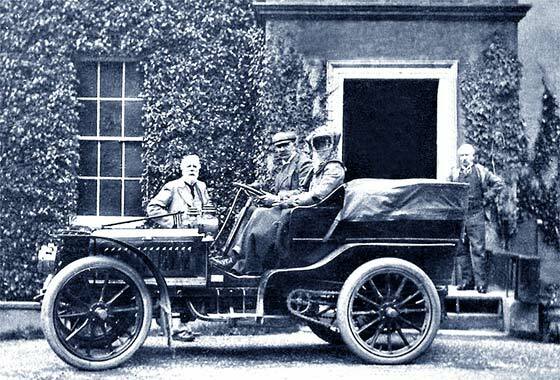 This is a cca 1906 Richard Brasier 25'36, Charabanc body. Another photo received from our regular contributor Joao Ferreira (Portugal). This is a photo of a Berliet (?) crossing de river Tagus long before the bridges were built. -- Sorry no. The rad is most definitely a De Dion Bouton but closer study suggested that I had seen this very car before. Bit of research advised that this car in on our HELP Page 53 as a cca 1907 De Dion Bouton AU Rear Entrance Tonneau from the newspaper "O Século" that covered the "Raid Hípico" (horse race) 1907. Another lovely photo received from our regular contributor Joao Ferreira (Portugal). 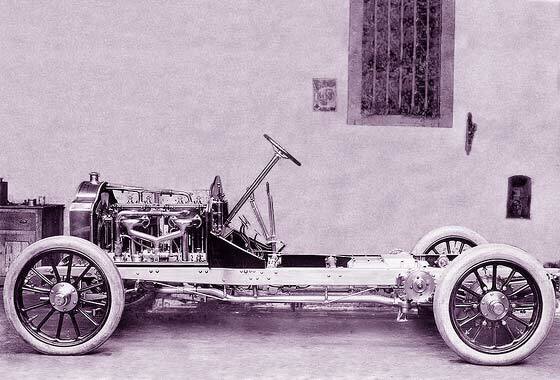 The photo is marked as a 1907 De-Dietrich 40-50 hp, 4 cylinder 8950 cc in chassis form, imported by "Soc. Portuguesa de Automóveis" Lisbon, which I suppose is correct? -- Sorry not quite. SLAE De Dietrich (employing Ettore Bugatti) had factory in Germany making Dietrich cars (stopped 1904) and in France making Lorraine Dietrich. Therefore, this is a cca 1907'8 Lorraine Dietrich 40'50 chassis. Another intriguing photo received from our regular contributor Joao Ferreira (Portugal). In the photo are the first Taxis operating in Funchal on the island of Madeira. The one with the registration 11-M seams to be an Argyll, but the other three looks identical, can it be a fleet of Argyll taxis?? -- They certainly are Argyll's. The twin filler caps on the scuttle confirm this. Exterior door handles on far left ones date as cca 1912 Argyll Light 15 or 20hp Tourer. The others could possibly be little earlier. 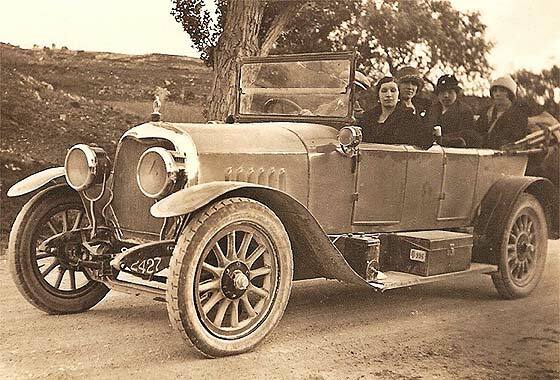 Interesting and puzzling pre WW1 photo from Bob Osborne (UK) who would much appreciate the name of the maker of this car. "Primrose" was painted yellow.-- Puzzling registration NB 107 is from Manchester CBC, Summer 1919, but the car is much pre WW1! Concentric circular rad limits the manufacturers and we feel this is a cca 1912 Bentall 16'20 Two-seater. Bentalls (1797-1984) were agricultural engineers and their cars in chassis form were bought by farmers. Rads came from France. Another unusual car being investigated by AutoPuzzles, and is one which we have identified. Being quite uncommon, and therefore useful in spotting similar cars, it warrants a mention in these pages. -- Quite an obscure model built in Germany for the Russian market. 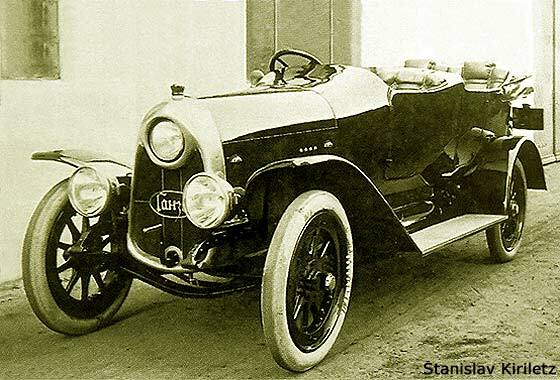 The logo on the radiator reads in Cyrillic 'Ganza' whereas it is actually a cca 1913 Hansa G12 36HP Tourer. Hansa started in 1906 and merged with Lloyd in 1914. In 1929 they became Goliath Bogward. Bogward closed in 1961. Broken glass negative found in a shed by John Thompson (UK). 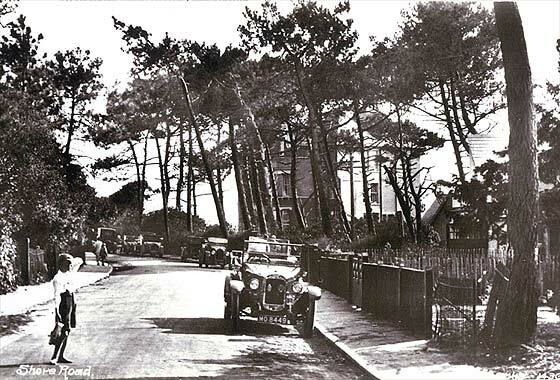 There may be a connection between the cars and other photo plates connected with Lord Eversley, Charles Kingston and Heckfield Place in Hampshire. -- We had first to have a go at repairing and cleaning the photo to be able to have a stab as to make. Cleaning requires concentration on details which soon identified this a cca 1914 Ford Model T Touring. Dating from the lack of louvers and windscreen type. Rather interesting photo received from Neil Storey (UK) of troops and cars somewhere in England in 1915. Are they Talbots? -- Sorry no. Initial thoughts Darracq from the height of the header tank, but as quite obviously still in chassis form with wooden drivers' seats used during delivery to the War Office, thoughts turned to vehicles used a lot by the WO, Wolseley. 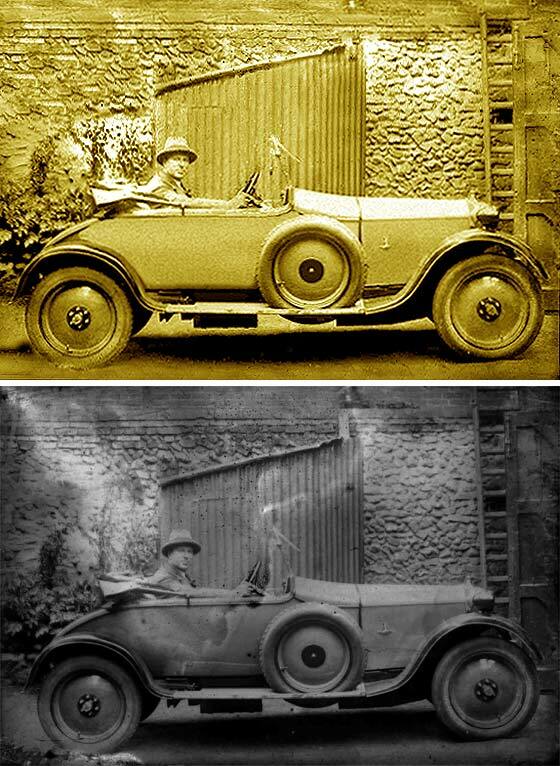 Wolseley and Darracq have similar rads, and confirmed by John Warburton as batch of WD 1914'18 Wolseley 26'30s. Lovely photo, which got stuck in my Spam Filter, received from Darik Peet (USA) saying nobody knows what kind of car this is. Grandfather is on the right, and friends dad is at the drivers seat. Hope you cats can help -- Darik plays my kind of music and is worth a listen!! The car looked complicated initially but the sight of the aftermarket Hassler Shock Absorbers on a transverse spring said this is a very non standard Ford Model T Speedster. No standard panels etc showing to help dating. Stripy photo received from John Tucker of Spaxton in Somerset (UK) taken in nearby Pightley Corner, all down Bridgewater way. 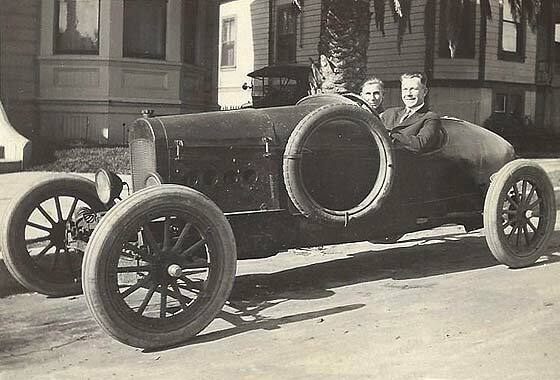 Would be very grateful to know the make and approximate date of the car.-- At fist glance looks a bit Model T-ish, but obviously is not. Looks American and was made by second largest manufacturers of cars in USA in 1918. This is a cca 1922 Overland Model 91 Touring. Overland became Willys, and was ended in 1926. Willys went on to make the Willys MB, the Jeep. 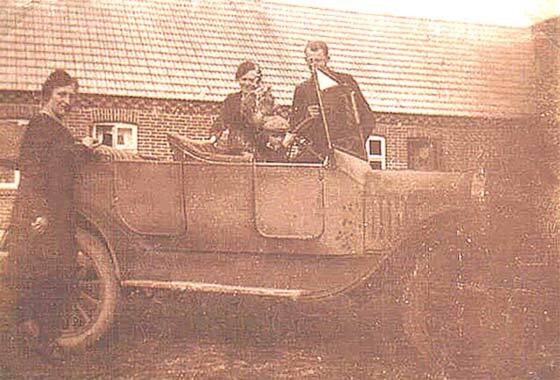 Unhelpful photo received from Jens Schou (Denmark) saying that the car belonged to a brother of his grandfather and the picture is shot around 1925 in Navr, Westjutland, Denmark. Sorry about the quality of photo. Could it be a Fiat? -- No. 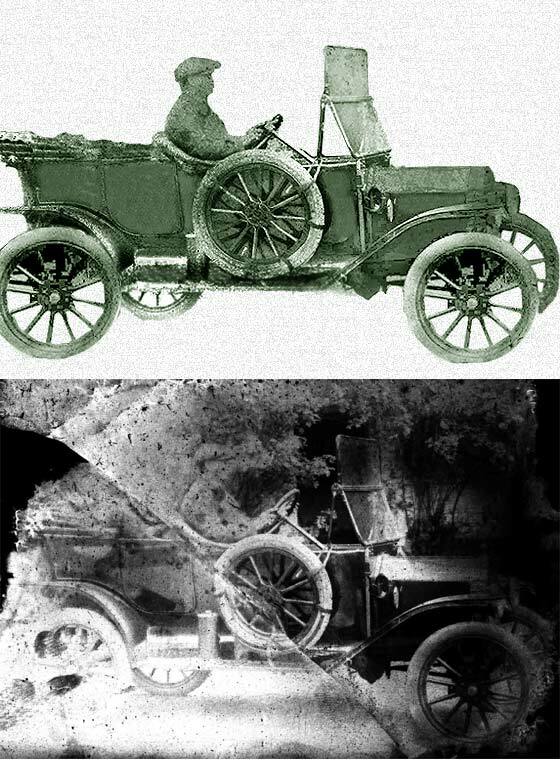 Most of the defining features of the car are either fuzzy of hidden, but fortunately the overall impression of the car judging from the body is cca 1923 Ford Model T Touring. Dating can be taken from the louvers, from the bonnet, windscreen and wheels. Damaged glass negative found in a shed by John Thompson (UK). There may be a connection between the cars and other photo plates connected with Lord Eversley, Charles Kingston and Heckfield Place in Hampshire. -- The photo required a cleanup but the manufacturer is quite clear. This a cca 1924 AC Royal Roadster. 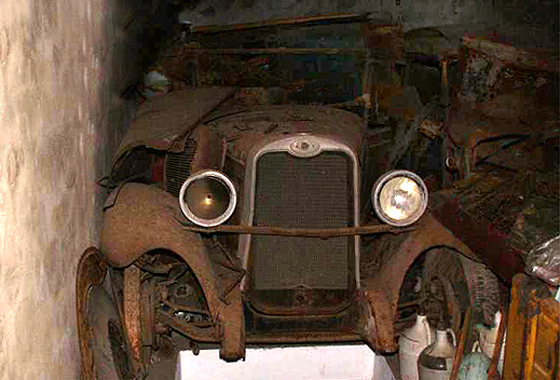 Dating from lack of louvers on the bonnet introduced after 1924. The Royal and Empire were similar, the Royal being the De-Luxe version. Unusual headlamps? 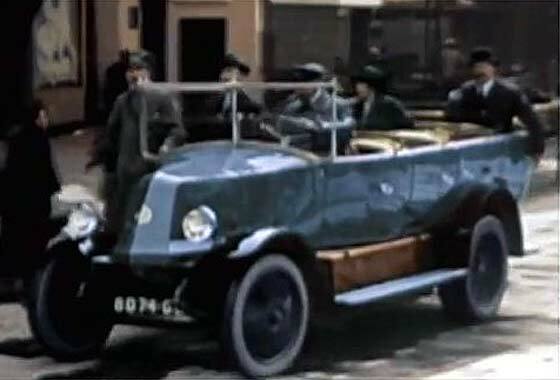 Cinema screen grab of a vehicle which appeared in a French 2011 TV Documentary "Louis Renault & André Citroën, la course du siècle" (...the race of ther century) where the vehicles are being investigated by IMCDB. -- Renault cars and commercials were initially well known for having the radiator at the back of the bonnet as a decorative brass item. In the early 1920s they streamlined the radiator and scuttle, with exit louvers for rad back inside. This is cca 1925 Renault OS Charabanc. Lovely photo received from Bill Bowen (USA) taken probably in Madison, WI. 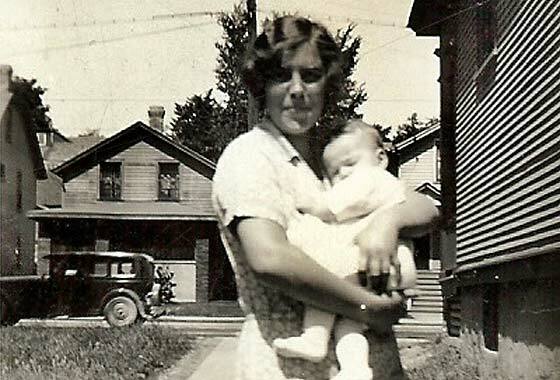 Baby in photo could be grandmother, Virginia Elaine Johnson born 1920. Dating car might help identify baby. -- Car is big/expensive/well used, possibly Gardner? Roof overhangs fashion started cca 1922 and rectangular look lasted to about cca 1932. Baby is about one, so photo c1921? No way. Dress expert Jayne Shrimpton says hair/hemlines definitely not '21 but late 30s/40s, to early 50s. Likely next generation. Lovely rural photo received from Tom Moore of Poole (UK) taken in Shore Road, Pole, Dorset. All he could find out was that car was registered in Berkshire, probably in Reading. -- MO is indeed Berkshire CC based in Reading, issued 1926. There appears to be a bar between the wings going forward of the radiator which is either a trick of light or later mod, because the car has all the other attributes of a cca 1926 Austin Heavy 12-4 Tourer. The car in the background is a Singer Junior. Intriguing photo received from Neil McMurdo (UK) taken near Burnmouth, Berwickshire, Scitland and on Facebook page called Burnmouth Past . -- Actually a very difficult one which we have not been able to crack and is on our Help Page 51 as UNIDENTIFIED. 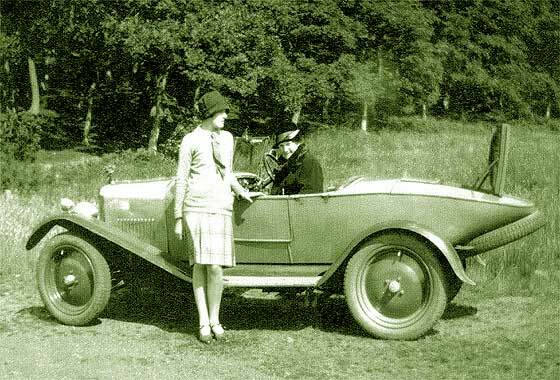 However, our Tim Harding has come back to us saying that he is certain that this racy thing is a cca 1926 Rover 9/20 Sports. He thinks the sportiveness was in the body!! Have traced a Super Sports same shape! 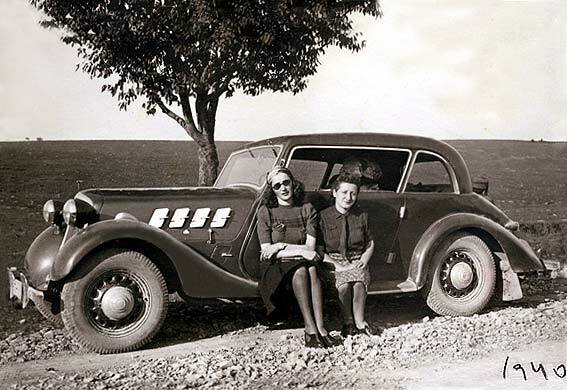 Another from a new lovely batch of photos received from Cicos Florin in Constanta by the Black Sea (Romania) who is interested in old cars of Romania. -- Quite a puzzling car initially with a 'traction' type front but a more teutonic type of back. Search therefore concentrated on German manufacturers, and indeed a German 1935-37 car. This is a cca 1936 Hansa 1100. Hansa and Lloyd merged in 1914 but were bought in 1929 by Carl Bogward of Goliath. Eventually forced to liquidation 1961. More identifications of vehicles on the website run by Ludham Village in the Norfolk Broads (UK) relating to photos by resident Nita Townsend who was over 100 years old. This little tractor features in several photographs. -- Interesting little gadget made by the famous British agricultural machinery company Ransomes of Ipswich. 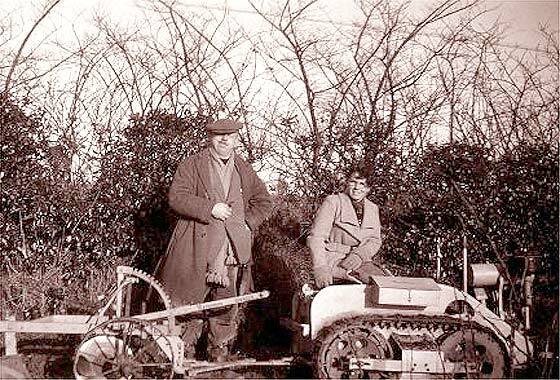 The MG2 Motor Garden Cultivator introduced in 1936 at £135 used a Sturmley Archer 6hp engine, and Roadless tracks at 2mph! New Model MG5 came in 1948. Another Photo received from Job van Huizen (Holland) asking if the SVVS could help him identify this car ? It was present at a British car meeting in Switzerland (Mollis). Looks a bit like a Vauxhall? -- Not a Vauxhall but another US owned British company. This one started in 1847 making bicycles, and cars by 1907. Taken over by Humber in 1929, who were taken over by Rootes in 1931, became Chrysler 1967, sold to Peugeot in 1979. 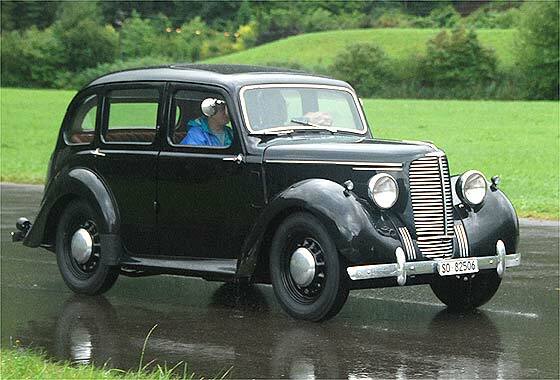 This is a Hillman Minx Saloon Phase I made 1940-47. 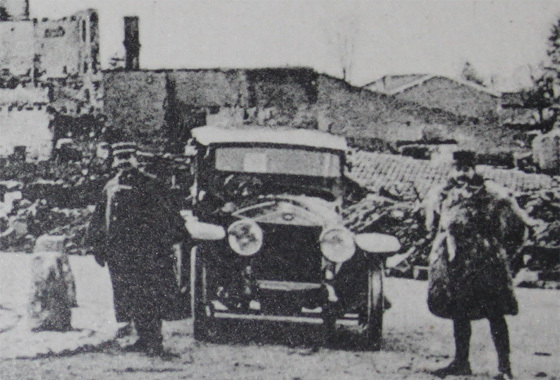 Dark Blurry Photo received from Chris Wiggins (UK) who is trying to identify the car in the photo, which was a French WW1 postcard. The card is titled "The War 1914-1918 - The Battle of Marne - The Ruins after the Germans Retreat. " Suggested it might be a Graf & Stift. -- Remained unidentified until John Warburton suggested it is one of the staff Sizaire Berwicks used by Marshal Poincarre at Vassancourt winter of 1914-15. 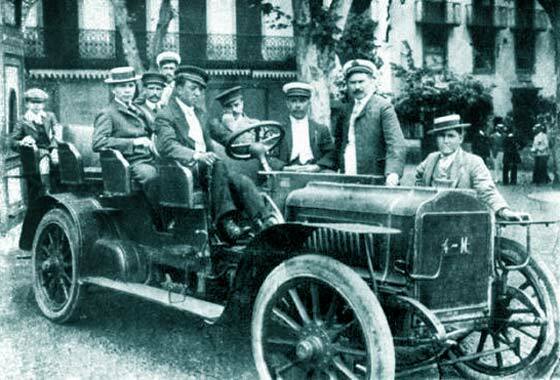 Georges Sizaire was the General's driver. No regn. number! This photo has been doing the rounds of a number of car websites and continues to remain unidentified. We received it from our regular enquirer Joao Ferreira (Portugal) on behalf of a friend. On board are some relatives possibly his mother and aunts, traveling somewhere in Portugal. -- Really quite pretty unusual radiator on otherwise unexciting tourer built just before WW1, possibly just after. Likely to be French. Does have some resemblance to Panhard Levassor X19, but not quite.